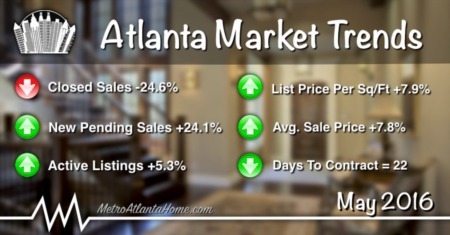 As we approach the end of the summer, the Atlanta real estate market continues to favor sellers. Sale prices have continued to increase, days on market is at a record low, and the active inventory of homes for sale is still relatively low. More sellers are looking to cash in on the increase in their home’s value, and the increase in new listings has yet to overtake the demand from buyers. If demand continues to outweigh supply, the seller’s market will likely persist. Oddly enough, pending home sales remain abnormally high, despite the lack of inventory for sale. Normally, the abundance of pending sales would result in a much higher number of closed sales, but that wasn't the case. Although the number of closed sales has rebounded from drops in previous months, they’re still not where they should be based on pending sale data. I believe the pressure on buyers to win bidding wars, along with the unrealistic time frames negotiated in many contracts, have caused countless deals to fall apart; hurting both buyers and sellers. Ever wonder just how much real estate is sold during the peak summer months? 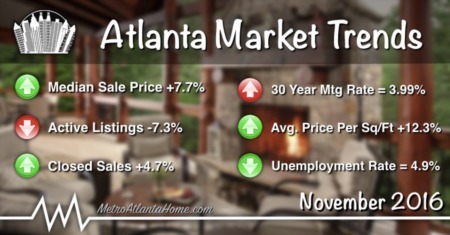 Well, last month alone we saw more than 2.4 billion dollars worth of real estate sold in the Metro Atlanta area. However, this number only includes properties listed on FMLS. There were also many homes sold that were only listed on GAMLS, or sold by owner, therefore, not included in this amount. With average sale prices and the number of closed transactions up, this has had a positive impact on overall volume. One of the market trends that explains why so many buyers are having a tough time finding a home to buy, is the median days to contract. Last month, we saw this figure drop yet again; a clear reflection of the seller’s market we’re currently experiencing. At no other time in the past five years have we seen the properties that are selling, go under contract so quickly. As you can see in the chart below, this year the DTC has reached crazy lows. Back in June of 2011, the median days to contract was 60, more than three times longer than it is today. The market began to recover in early 2012, and by that June, the median days to contract was down to 41. Since early 2013 we’ve seen a very similar trend and year over year numbers have remained consistent. However, this year DTC has dropped to uncharacteristically low levels, fueled by strong buyer demand and continuing lack of inventory. In June, the number of single family homes for sale remained low, just as it has been since about November of last year. The near double digit declines in year over year active inventory is the result of the massive jump in properties going under contract. Even with double digit YOY increases in new listings during February (11.4%) and March (11.9%), the number of active listings has yet to see substantial growth. As you can see from the chart above, active listings dropped like a rock from July 2011 (40,140) to December of 2012 (20,466). With the overall market gaining strength the past two or three years, demand has outweighed supply. Just when it seemed like demand would start to slow (due to price appreciation), things jumped back into high gear again early this year. If the majority of the current pending sales are able to close, we could see extremely low inventory levels as we head into the fall and winter months. I pulled up the chart below to get an idea of how the market has improved for non-bank-mediated sellers (excludes short sales & foreclosures) over the past 5 years. As you can see, there has been a pretty gradual improvement in prices since things bottomed out around January of 2012. In a little over four years, the average sale price of non-distressed properties has increased about 75%. Although prices in June were only up about 1.9% from last summer’s high of $275,995, it’s clear the market is still very strong. While some numbers point to continued above average price appreciation, this chart shows me that sale price increases are starting to return to their historical norm. Either way, home values have increased to a point where most homeowners who purchased prior to the crash in ’08, now have positive equity in their home. The median sale price to original list price (SP to OLP) ratio shows just how close sellers are getting to full asking price. In June, the SP to OLP ratio was 97.9%, down 0.1% from a month earlier. However, as you can see in the chart below, the SP to OLP ratio has peaked in the month of May the past two years, then continues to drop through the end of the year. At around 98%, there’s not much room for improvement, as most homes will sell for less than the original list price. Despite the red hot market for sellers, where bidding wars are common, the typical seller will price their home slightly higher than market value and expect to be negotiated off their price a little. At the bottom of the market, back in 2011, we saw the SP to OLP ratio go as low as 90.6%. That was a time where multiple price drops were common, and many sellers were desperate for an offer. My how things have changed in five years. The sale price of homes in Alpharetta saw a significant bump in the second quarter of this year, increasing 8.3% compared to Q2 of 2015. At more than $436K, the average sale price is up nearly $80,000 from the first quarter of 2015. Consequently, the average price per sq/ft also jumped in Q2, up 6.1% year over year to $139. Median days to contract was extremely low last month, dropping 25% YOY to only 12 days! Active inventory of homes for sale finished the month up 6.1% YOY, while closed sales were down 8.6%. 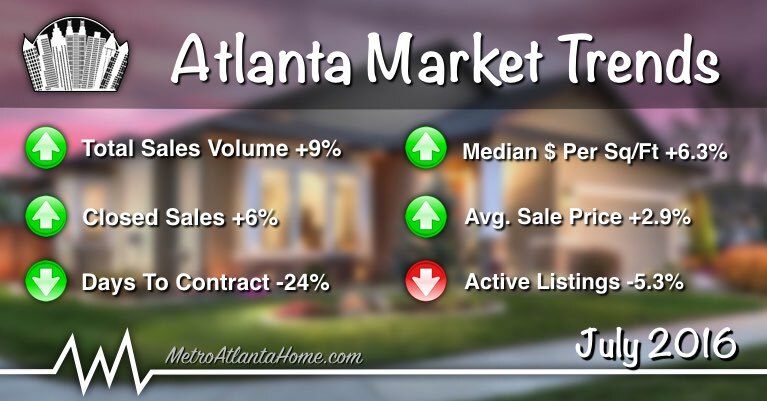 New listings and new pending sales remained relatively steady at 2.5% and 3.9%. A welcomed sight for Brookhaven home buyers, active inventory of homes for sale in the city was up 14.2% compared to last year, largely due to the influx of new listings, which were 20.6% more than there were last year. The additional inventory the past few months has helped push closed sales higher. 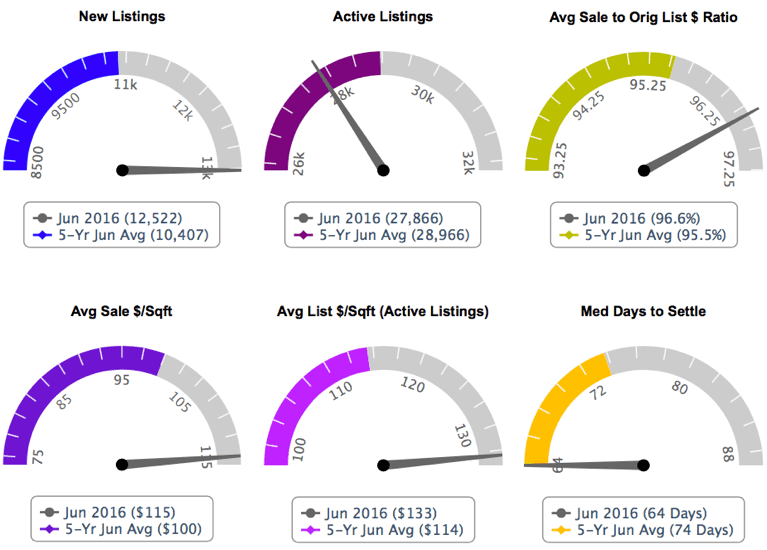 In June, there were 112 closed transactions, representing a 23.1% increase from June 2015. In Q2, sale prices spiked 9.4%, topping $528K. The median days to contract remained low at 16, while the average days to contract dropped 13.9% YOY to 31. Yes, you read that correctly, Chamblee real estate is selling quickly. The median days to contract for properties sold last month was 6. The housing market in Chamblee has taken off this summer, with tons of new construction and renovations spotted all over the city. Closed transaction were up 23.8%, despite the active inventory being down 9% compared to last year. The 14.9% increase in new listings couldn’t push the inventory higher, especially when so many homes were under contract almost immediately. The average sale price continues to climb, now over $328K.